When it comes to rotating assets such as fans, blowers, pumps, cooling towers and other equipment powered by AC induction motors, vibration analysis is an effective diagnostic tool. It delivers the granularity required to isolate root cause of anomalous behavior in a timeframe that is useful to industrial maintenance operations. The general types of vibration sensors include displacement sensors, velocity sensors, and accelerometers. Accelerometers are the best choice for most industrial rotating assets because they are simple, easy to apply, and very sensitive to the high-frequency vibrations typically generated during force-failure. A piezoelectric vibration sensors uses the effect of mechanical strain caused by high-frequency motion of the equipment to detect acceleration and, hence, vibration. Certain materials such as quartz exhibit the piezoelectric effect, in which applying a mechanical stress to the material generates a positive or negative voltage. In a piezoelectric vibration sensor, the piezoelectric material is sandwiched between an unconstrained proof mass and the sensor frame. The sensor, in turn, is fixed to the device under test so that vibration of the asset causes the sensor housing to move. The inertia of the proof mass causes it to apply stress to the piezoelectric material, generating a voltage. In vibrating equipment, the sensor will generate a pulse stream. 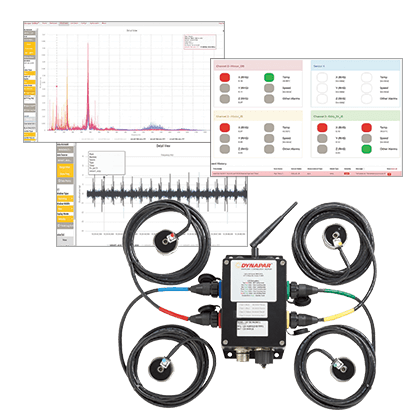 The signal can be presented as a time waveform or processed by FFT to convert the data into a frequency spectrum for additional vibration analysis. Piezoelectric sensors are effective and well-characterized. They operate with frequencies of up to 20 kHz and accuracies on the order of 1%. On the downside, they are expensive. The sensor engine alone costs between $300 and $500 for a single axis. 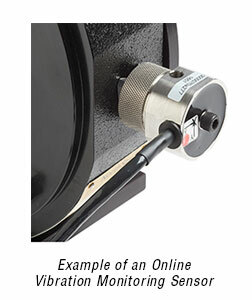 In the case of a triaxial vibration monitor, the sensors alone could cost more than $1500. The sensor alone is not enough, however. Piezoelectric accelerometers are inherently analog, so they require additional processing electronics to digitize the signal. On the upside, that enables the team integrating sensor engine and electronics to define the frequency properties through their choice of analog-to-digital converter. On the downside, the external electronics add both complexity and size, as well as increasing power consumption. Higher power consumption can be an issue for wireless vibration sensors that are battery-powered. Changing the battery on a single sensor every few years might not be a hardship. Changing hundreds of batteries in wireless sensors deployed across the facility can consume a significant amount of time. This is a factor for industrial maintenance departments, which are typically oversubscribed as it is. MEMS-based accelerometers provide an alternative. MEMS-based vibration sensors are lithographically fabricated, which allows for chip-level integration of the sensor engine with the support electronics. These benefits result in compact, robust, economical vibration monitoring systems. Once considered an exotic technology, MEMS-based vibration sensors have become increasingly popular as a result of advances in data analysis and signal processing. Specifics vary depending on readout but the basic architecture consists of one or more micromechanical structures fixed to the housing, and separate structures attached to a freely-moving proof mass. When the equipment being monitored vibrates, the proof mass moves the attached structures so that they interact with the fixed elements. Readout technologies include capacitive sensing, piezoelectric sensing, piezoresistive sensing, and thermal sensing. In a capacitive MEMS vibration sensors, the fixed components consist of fingers that are interleaved with corresponding figures attached to the proof mass (see figure 2). When the device under test/proof mass move, the separation between the two sets of fingers changes, modifying the capacitance. The amount of the motion is proportional to the vibrational force, which enables the system to not only calculate frequency of oscillation but also magnitude. Image: In a capacitive MEMS accelerometer, fingers attached to an unconstrained proof mass interact with fingers fixed to the sensor housing/equipment. Vibration causes the proof mass to move, modifying the spacing between the two sets of fingers and altering the capacitance. In a piezoelectric MEMS sensor, the proof mass is connected to the sensor housing by a piezoelectric structures such as a spring (see figure 3). When the asset vibrates, moving the sensor housing, the inertia of the proof mass alternately stresses and compresses the piezoelectric structure, generating voltage pulses. A piezoresistive MEMS sensor uses the same type of approach as a piezoelectric version. The difference is that the device incorporates a piezoresistive material, typically silicon, for which the resistivity changes as a result of mechanical strain. The mechanical structure of the sensor is similar to that of the piezoelectric version. A thermal-readout MEMS sensor is based on a small sealed cavity containing a sample of gas molecules that are heated by a thermopile. Thermal sensors bracket the cavity. Vibration accelerates the molecules so that the distribution becomes asymmetric. The thermal sensors register the change in distribution and readout circuitry converts that to acceleration. Of these four options, capacitive MEMS accelerometers deliver the best performance for industrial applications. The technology is robust and low-power, enabling wireless vibration sensors to run for an extended period without battery change. Despite their appealing price and ease of use, MEMS vibration sensors have been less popular than piezoelectric accelerometers for industrial condition monitoring systems. The problem is that MEMS accelerometers have historically displayed frequency errors as high as 10%, which can lead to misinterpretation of the data, making it difficult to accurately determine the root cause of a problem. Accuracy concerns have also limited the uptake of MEMS accelerometers, even though their pricing enables broad deployment on assets across the facility. Advances in signal filtering and analysis technology have also significantly increased the accuracy of MEMS accelerometers. For example, the Dynapar OnSite condition monitoring systems MEMS inaccuracy is better than +/- 0.25 % (or +/- 1 Hz over the entire measurement range) allowing it to provide high quality data at an affordable price. Similar efforts have also broadened frequency bandwidth for MEMS systems. Engineering always involves trade-offs. Performance improvements to MEMS-based sensors have made them viable monitoring options for many industrial situations. OEMs and end-users should consider their specific applications to determine whether they can take advantage of the improved pricing, robustness, and ease of integration that MEMS accelerometers offer.